Nowadays students of inter part 1 are searching for the past papers to prepare for their annual exams of Gujranwala board and thus they tend to search online past papers. 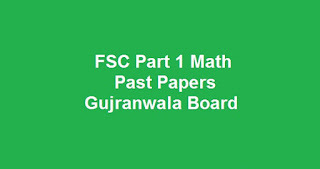 So we have uploaded FSC Part 1 Math Past Papers BISE Gujranwala Board which you can Download for All Past Years. To get more updates like this about Past Papers for intermediate than stay tuned to the www.taleemwala.com homepage and also comment for any query.